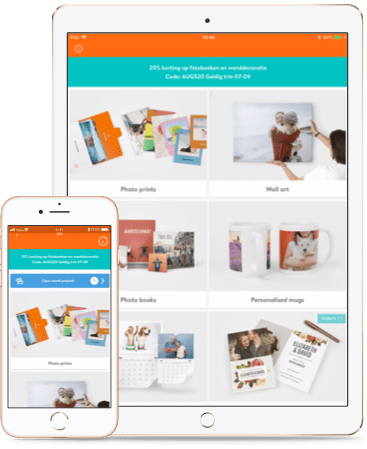 With our free mobile and tablet apps for it’s fun, quick and easy to create photo books, wall art, calendars and photo prints. Easily import from your photo library as well as Dropbox, Facebook, Instagram and Google Photos. Get creative. Try it now! With our free app, you can put together a photo album on your phone with just a few swipes of your finger. Want to show off those spectacular holiday snaps, or gather together some treasured family moments? Choosing between supple soft covers or sturdy hard covers, and selecting from a range of different sizes and orientations, you can create a finished item that's perfect for the job. Our photobook app lets you work with as few as 24 or as many as 120 photos. You can either design your own layout, or use the quick fill button to paste in one photo per page. The app will then show you an overview of the photobook, and you can tap on any page to edit it, adding borders, colours and text. For flexibility and ease of use, this has to be the best photo book app on the market. As well as photo albums, the bonusprint app makes it easy to design a whole host of other high quality items. Brighten up your home with unique wall art printed on canvas, aluminium or acrylic, using our helpful previews to picture what the piece will look like in a typical living room. Order durable photo prints of your favourite family portraits in a selection of different formats. And if you're in search of a gift, don't forget to check out our personalised mugs, cards and photo calendars. Everything benefits from your own creative input, while being finished to a professional standard. Just load up the app and scroll down to see your options. The bonusprint photobook app works as a collage maker in several different ways. One approach is to upload a selection of photos onto an individual piece of wall art, then arrange them using the one-click layout options. Alternatively, why not assemble several smaller pieces of wall art into a single larger display? However you go about it, you'll enjoy all the functionality of a dedicated photo collage app. Whatever the photographic task, the bonusprint app is an invaluable tool and photo service app. You can quickly import photos from Facebook, Dropbox, Instagram, Google photos and of course directly from your own phone. Once uploaded, images can be cropped, rotated or flipped with a touch of the mirror button. And all the while there are videos and tours to help you visualise the choices on offer. Operating smoothly on both Android and iOS platforms, our photobook app is equally fast and efficient whether you're working with a tablet or smartphone, an iPhone or iPad. And thanks to its clear, intuitive interface, you'll be able to complete your photo project over a coffee break or in a few moments of downtime. Try it now to and see for yourself just how easy it is.